Just a quick post. So one of our dearest friends mother's just passed away last week. A favorite professor passed away a few days ago leaving behind a wife and kids. And a wonderful woman and good friend is in the process of saying good-bye to her Dad. I just can't imagine and it makes my heart hurt so much for all these people and their pain and loss. It also makes me admire them and how strong they all are. So everyone take stock today and bask in the ease and comfort of a normal day. Kiss someone you love. Most importantly don't flip a lid over tiny things that don't matter. Jason is growing a beard and I'm so excited! I just got on a beard kick lately. Like the really short but kind of late 70's early 80's type. The things that guy will do for me when I ask him. Some of it has to do with the fact that there is a beard contest going on at work (I didn't enter.....THIS time) and so beards are everywhere. Oh and my sister started calling Jason J-Toven on Thanksgiving because he did all the dishes and the steam made his adorable curly hair like three times its normal size. Now we all call him that. I'll have some Thanksgiving pics up soon but just know that I think we may have had the world's most perfect T-Day ever. It just ruled in every way. I can't wait for Christmas!!!! I'm alive I swear. My sweet cat Ava, sadly, is not. We had to put her down on Wednesday and it was sooooo sad and hard, but the right thing to do. I will post a pic of her once I can look at said pic without bawling. I'm just not ready. Other than THAT things are great. I've lost 8 lbs. We are slowly but slowly getting out of debt. There are some job prospects on El Horizon. If I ever open a Mexican breakfast joint I'm naming it that. COPYRIGHT!!!! There...that makes the idea legally mine. So there's my update for now. 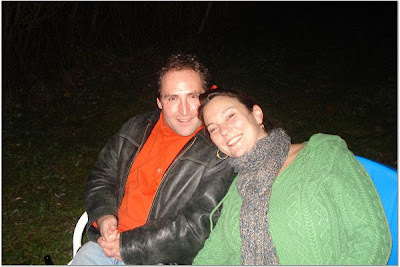 Here's a picture of me and Jason at the bon fire in Michigan a few weeks ago. I love our weird green and orange color scheme. It's so circa '81 Sears living room.